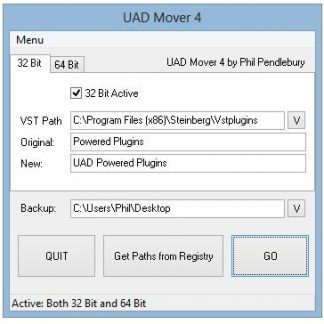 A little while ago I presented an article about how to set up Camtasia to record your DAW using The ASIO Multimedia Driver. It was a tricky one to do because those settings are very unreliable and sluggish to work with. Usually a screen cast will consist of real-time capture of your system display, possibly mixed with the system sounds and a narration track of some kind. It is much quicker (although maybe a little more prone to mistakes – but that’s another story), if you record your sound playing back from Cubase or Nuendo, capture your movements around the project on-screen and simultaneously record your computer’s headset microphone as narration. In this article we will look at a way to use the RME Totalmix Loopback function to capture your DAW sound in all its glory. That’s nothing new – There are a number of articles that will explain how to use the Totalmix Loopback to record into Camtasia. Unfortunately, every single of one of those misses out 2 fundamental problems. 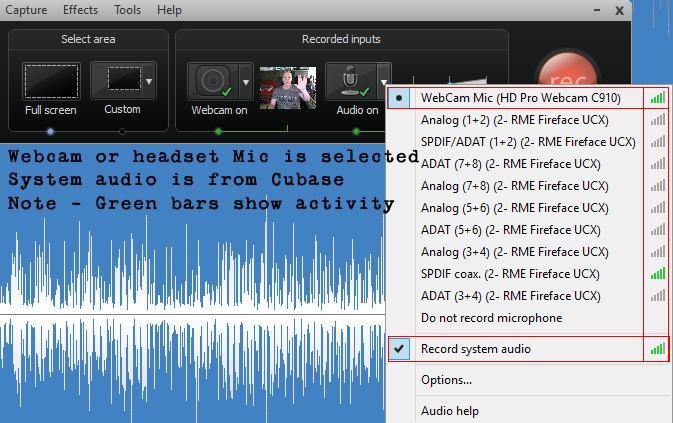 If you have a Webcam in the equation, Camtasia forces the input stream (not System Sound) to be a mono signal. You have probably already done this. 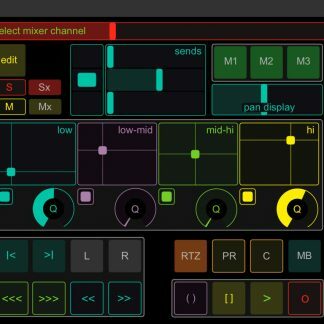 Also you will be aware that Totalmix, despite all its plus points does not use Windows Mixer. Which is probably also a plus but a little inconvenient for us at times. So we just need to make sure that your DAW sound is set to outputs Analog 1/2. There is nothing to change here. This will be done in your audio application. But just for consistency it is a good idea to label it in the Windows Sound Mixer. 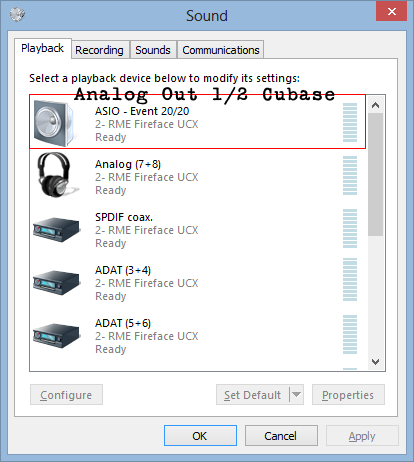 In order to be able to control Windows sounds separately from our ASIO stream in Totalmix we need to direct Windows Sounds to Analog Output 3/4 using the Windows Sound Mixer. 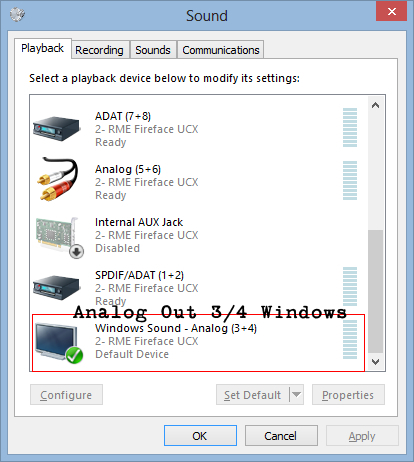 Set Analog Out 3/4 as your Default Sound Device in Windows. Of course you can use whatever output you choose just remember to adjust the other steps accordingly. This is the part that you may have already done. Once this is done you can select the SPDIF input in Camtasia Recorder. But the problem is, as mentioned above, that the signal will be mono when the camera is activated. Plus there is no way to also record a headset or separate microphone as another stream. 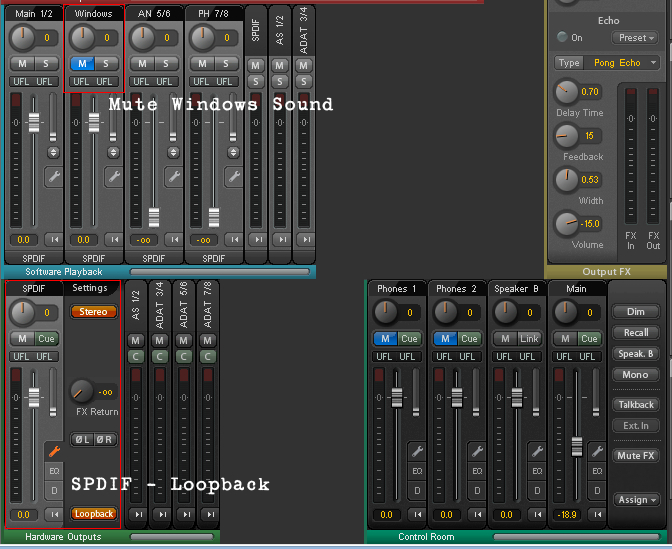 So we set up the Totalmix Loopback as usual and also MUTE our Windows Sound channel – Analog 3/4. Select the SPDIF Channel in Totalmix and raise the Analog 1/2 fader to send a signal to it. then hit the wrench to expand the SPDIF controls and enable “Loopback”. It is a good idea to save this as a Snapshot and save your default settings first. It is a shame we cannot save the Windows Mixer settings Snapshots too. This is why we directed the Windows sound to Analog 3/4 and muted the Windows Sound Channel earlier. We now go to the recording area of Windows Sound Mixer and find the SPDIF input. Click Properties and enable Listen to this device. This is now sending the SPDIF input to Windows and it appears in Camtasia as… System Sounds… Great. Now we simply need to make sure the camtasia Recorder is set correctly. Make sure your audio format is Stereo (I am using 48K but that choice is yours). Make sure Record System Audio is checked. You should be able to see the green bars indicating audio activity if you drop down the list of inputs as in this screenshot. 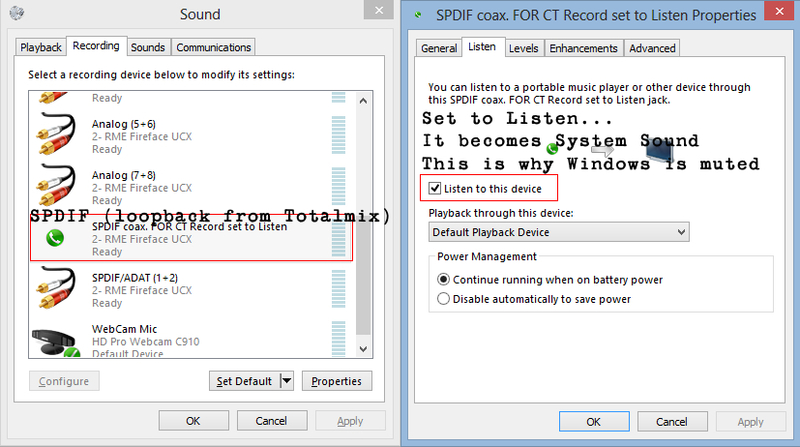 Don’t forget to switch back to your default Totalmix settings and turn off Listen on the SPDIF input in Windows Sound Mixer once you have finished recording. 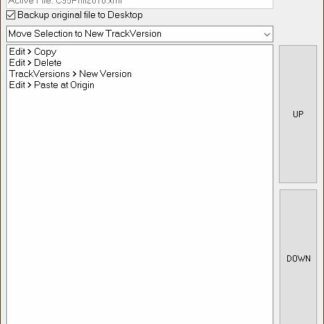 You may find a slight delay on the system sound due to the loopback method but it is very easy just to knock it back into place when at the editing stage. I hope you find this useful. I suppose I should point out that there are other ways to do this, if you do not need the separate streams from webcam and headset mic. Then the normal Loopback method will work fine.